Find a saying you like online. 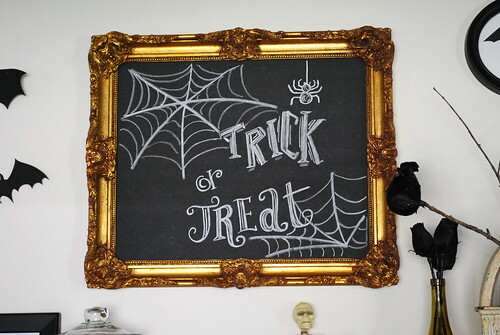 I googled “halloween chalkboard” and tons came up. I found one I liked and used it as a guide to draw on my foamboard. then I practiced on the back before writing it on the front. I found this one and drew it for our Halloween Mantel! Good luck! Very cool. Very clever. And the frame can easily get used again for something different.